Find and book a hotel in Bologna. With location maps and guest reviews. Bologna is an excellent weekend break destination; an attractive city with a walkable historic centre, famous for its food and with a decent smattering of cultural sights. Bologna airport is just outside the city centre with direct flights from London and other UK and European cities, so it's easy - and often cheap - to get there. 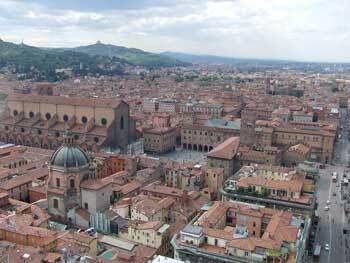 Unlike Rome or Florence, say, Bologna is not overwhelming. There is just about the right amount to do in a two or three day trip without feeling rushed. As it's a great place for pottering and enjoying the foodie culture, it offers an easy, enjoyable and safe experience to travellers looking for a no-hassle getaway and good value for money. As part of a longer stay, Bologna makes a good starting-point for exploring the green Emilia-Romagna region, and visiting other appealing destinations such as Ravenna, Ferrara, Parma, Modena or Rimini. Bologna began life as an Etruscan town, and relics of the town's early phase of development can be seen in the town's archaeology museum, the Museo Civico Archeologico. Bologna is a handsome, red-brick city, packed with palazzi. One of Bologna's defining features for the last thousand years has been its university, the oldest in Europe. Many of the buildings and museums which dominate the town's historic centre are legacies of this heritage. There was a shortage of roomspace for university's many students; Bologna's solution was to build porticoes over its streets, extending the houses above to create more accommodation. These sweeping porticoes are a striking feature of the town's distinctive architecture. Today Bologna is still noticeably a student town, lively and entertaining. The town is also known throughout Italy for its left-wing politics. Bologna tourist attractions are centred around the town's main square, Piazza Maggiore, and the adjacent Piazza Nettuno (complete with fountain of Neptune). Dominating the piazza is the large and never-finished Basilica di San Petronio. Like so many Italian cities, medieval Bologna was the scene of inter-clan rivalry, and two of the towers resulting from the competition between the town's families are now famous tourist sights. The Due Torri of Bologna are two leaning structures, built in 1119. The shorter, Torre Garisenda, was immortalised in Dante's Inferno. 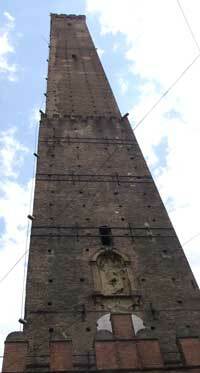 The taller tower is the Torre degli Asinelli, which is over 300ft tall, and which is open to the public. It leans about 3ft, and if you're not feeling too giddy, the views are worth the climb. Bologna's principal art gallery is the Pinacoteca Nazionale, containing works by local artists and others, including Guido Reni, Raphael, Giotto, Titian and Perugino. The main Bologna Tourist Information Office is located in Piazza Maggiore; there are other branches at the railway station and airport. At the time of writing there is an excellent tourist card called the Bologna Welcome Card. This comes in a 48-hour or 72-hour version. It includes free entrance to the town's civic museums and half-price entry at Pinacoteca Nazionale, as well various other free tours and tickets (for the 72-hour card) or a choice of add-ons (for the 48-hour card). For the 48-hour card you can choose to include airport bus tickets, which is a very good deal if you plan to visit a couple of museums too. The Bologna Welcome website (see right-hand links panel) is useful for planning your trip by checking latest opening times, places to visit and suggested itineraries. If you'll be staying longer in Bologna, you might be interested in the Card Musei Metropolitani, aimed at residents, which gives 12-months access to museums. You can buy a card at the airport on arrival, and pick up a map to plan your stay. Bologna Marconi Airport (BLQ) is only 4 miles from the centre of Bologna, making it a very convenient short break destination. At the time of writing there are direct flights to Bologna from London (British Airways, Easyet and Ryanair), Dublin, Manchester, Edinburgh and other European cities, as well as internal flights around Italy. The airport has good transport connections, with a bus running into Bologna every 11 minutes. Called the Aerobus and operated by local transport company TPER, the bus is well-signposted within the airport terminal (follow signs around to the right as you leave Arrivals). Tickets are cheap, are valid for 75 minutes on city buses, and the journey only takes 20 minutes. Buy tickets before boarding; there are machines in the terminal near the bus stop (you can also purchase them online, but if you want to transfer to another bus you'll need to exchange your electronic ticket for a magnetic one at a kiosk/machine). Check the Aerobus website for the latest times and routes. At the time of writing the closest stop to the historic centre of Bologna is on Via dei Mille, about a 15-minute walk from the central Piazza Maggiore (if you are looking it up on a map, the stop is located on the southern side of Via dei Mille, between Via Montebello and via Galliera, near a branch of Feltrinelli.) The bus then loops around to Stazione Centrale, Bologna's train station, before trundling back to the airport. You can get on at the same stop on Via dei Mille. The airport tourist information office is on the left as you walk through the terminal towards the Aerobus (opposite Carrefour). The 'i' signs you'll see in the airport indicate 'airport information' not 'tourist information', so don't be led astray by these. At the tourist office you can pick up information and a Bologna Welcome Card - with the option of having your Aerobus tickets included. For almost all the tourist sightseeing you'll want to do in Bologna, you can walk. The historic centre is compact and attractive to explore on foot. If you're going further afield, Bologna has a good local bus network. It's cheapest to buy tickets in advance at bus offices, news kiosks or tobacconists, and then validate them in the machines on board the buses. There are ticket-vending machines on buses but you'll need the correct cash (currently 1.50 euros). On the TPER website you can check the best tickets for your needs, ranging from an hourly ticket to season tickets. An Aerobus ticket includes an onward journey on city buses for up to 75 minutes from validation. Bologna's railway station is called the Stazione Centrale, and connects the town with most of Italy's big cities. The bus station is nearby, with services to local destinations such as Modena, Ferrara and Ravenna. If you're planning to spend your entire holiday in Bologna itself, then the best place by far to stay is in the historic centre. Almost all Bologna's interesting sights are grouped within ten minutes walk of Piazza Maggiore, the city's principal square and the location of the Basilica of San Petronio. Museums, churches and handsome streets range out in every direction, so being close to the square itself will give you the optimal position for exploring. If you'll be travelling by bus from the airport, then there is a slight advantage to being on the northern rather than the southern side of the square, as you'll have a shorter walk to the bus stop - however, since there are also frequent city buses, this is perhaps not that important. The heart of town is best for eating and drinking, too - there is a very high concentration of restaurants, bars and food shops in the area called the Quadrilatero, on the eastern side of Piazza Maggiore, and spreading up towards the university in the north-eastern sector of the centre. I stayed in the two-star Hotel Centrale, which has an excellent location close to Piazza Maggiore. Although the hotel could have done with redecoration, it was a comfortable and very practical place to stay with generous breakfasts. If you're on a budget it's a good choice. One of the most central hotels you'll find is the smarter Art Hotel Commercianti, which is almost next door to San Petronio. A couple of streets to the north-east of Piazza Maggiore, Hotel Corona d'Oro is a traditional and historic hotel with elegant public spaces. If you'll be travelling on from Bologna you might consider staying near Stazione Centrale. However, this more modern area has less atmosphere, the immediate station area can be a bit dodgy, and you'll have a bit of walking or a bus ride to take you into the prettier heart of town. 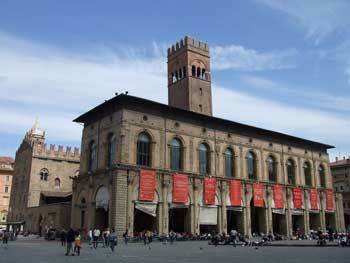 Bologna hosts trade fairs at its Fiera, which is just outside the centre of town to the north. If you're visiting the Fiera you'll find two or three hotels close by, including the modern Savhotel. When you've done a hotel search using the link below, you can use the left-hand menu to narrow down the search to the Fiera area. It's not much more than a mile from Stazione Centrale and connected by buses, so staying close to Stazione Centrale would be convenient, and staying in the historic centre is not particularly impractical. Travellers who will be driving a hire car during their stay in Bologna should note that like all Italian cities, driving and parking options are limited in the historic centre. You can still find central options with private parking, but you should check if this is available and any costs before you book. It would also be a good idea to get some advice from your hotel on the best route to get there to avoid one-way or pedestrianised streets. 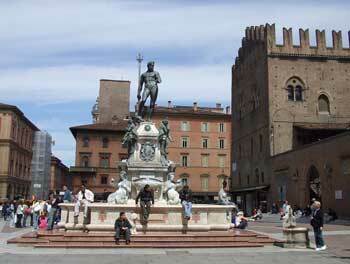 As well as hotels there is a choice of B&Bs and rental apartments in Bologna. An advantage of an apartment is that you can try food shopping in the local markets for fresh produce to prepare at home. As always, it's a good idea to check the small-print details closely, as with non-hotel options you may find restricted check-in hours, extra charges or a lack of luggage storage facilities. > Bologna hotels, B&Bs and apartments. You can opt to view the hotels on a map to pick the most conveniently-located (but do check the latest reviews too).